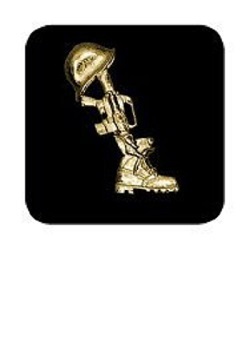 This all-brass pin features a soldier helmet, boots and rifle, indicating tribute to a fallen solider. 1/21/2019 – About the final tribute pin: is the square black background part of the pin or just to view it better online? Response From Patriot Guard Riders: The black in the picture online is just to showcase the pin itself better. The pin does not have a black background.